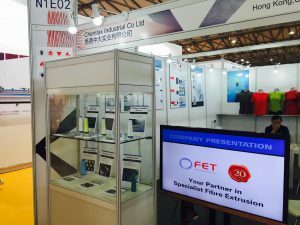 FET enjoyed a successful attendance at September’s Cinte Techtextil China exhibition in Shanghai. Sharing an extended stand with its agent and partner Chemtax Industrial Co which provides an invaluable service in supporting and enabling FET to effectively reach China and its immediate area both geographically and culturally. FET secured new fibre extrusion systems as well as upgrades for existing clients with a combined potential value of more than $2 million. Cinte Techtextil China is Asia’s leading biennial trade fair for technical textile and nonwoven products. With the rapid growth in the China market, the demand for high quality technical textile is enormous and the previous show in 2016 saw a record-breaking 480 exhibitors from 26 countries. It is therefore an ideal medium for FET to showcase its range of products and ability to find technical solutions for manufacturers of high value textile materials. The exhibition was well attended and FET was able to make invaluable face-to-face contact with customers old and new. Once again the focal point of the stand was the FET-100 Series multi-functional laboratory and pilot melt spinning system. FET will next be attending Techtextil Frankfurt and ITMA Barcelona with its own bespoke exhibition stand in May and June 2019 respectively.